Technology gets better every year. Every year computers get faster, more powerful, and more efficient. 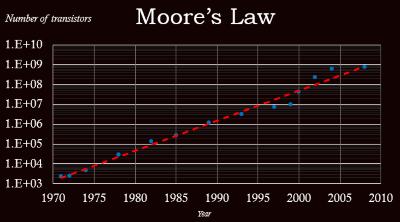 I’m sure you are all familiar with Moore’s Law (Number of transistors that can be squashed onto a computer chip doubling every 12-18 months). It’s not just microprocessors, it’s all the peripherals too. Every time I look at upgrading my PC, the default hard drive size available (for the same price) has increased from the last time (and now solid-state drives are starting to become the norm). Screen sizes and resolutions also increase over time. Every time I read the specs on the next generation smart phones, the built in cameras seem to have more Megapixels than ever before. Scanners, digital printers, and photocopiers (which, these days, are simply composite hybrids of the other two) are also far superior than previous years’ models. †Actually, quite a lot. Attempting to counterfeit (or forge) money is a very serious offence. Depending on where you live, it can be felonious or treasonous; no good can come of it. 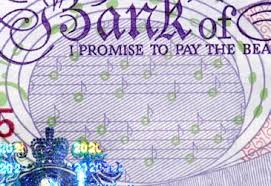 This posting is intended to educate you about technology embedded into the bank notes; it’s not designed to challenge you to break any laws. Don’t do it. I hope my readers are smarter than that. Technology might have caused problems, but technology is also employed to help neutralize the threat. 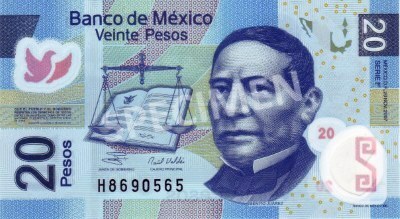 A modern bank-note is an incredibly sophisticated device. 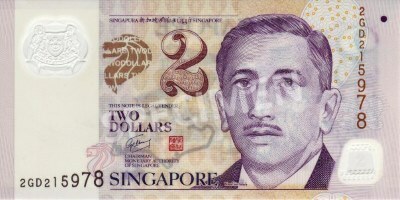 Special kinds of paper (and sometimes plastic) are used to manufacture bank notes, as are special inks. Some of these inks change colors depending the angle you look at them. Some inks can be made sensitive to heat and change color. Some inks are thick and their presence can be detected under fingers and thumbs. 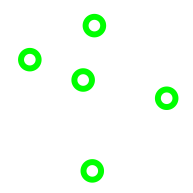 The ink can be magnetic to allow detection by machine, or be sensitive to non-visible light, or made to fluoresce under UV. ‘Water-marks’ can be embedded into the paper during manufacture, and/or threads, fibers, metals strips, stripes or other contrasting substances weaved inside. The printed designs are made very intricate, requiring high resolution printers to duplicate, and the spacing of lines in the engraved patterns are cleverly spaced so that if they are scanned at lower resolution, then moiré patterns will appear in the designs. Multicolored inks with subtle transitions can be employed and even foil and holograms included. 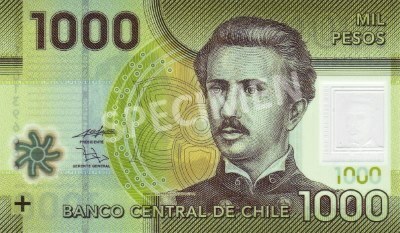 Of course, all bank notes have unique serial numbers too. 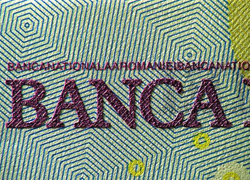 Bank notes can be peppered with patterns of micro-perforations drilled by lasers, or be imprinted or embossed to raise letters. A good list of current techniques used to protect bank notes can be found here. However one of the most interesting counterfeit prevention devices, and the topic of this post, is a construct known colloquially as the “Eurion constellation“. 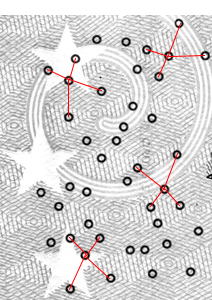 It’s a special pattern of dots that is baked into design of bank notes to allow scanning devices to identify the image of being a bank note (see right). You might not have noticed them, or been aware they are they, but they are hidden in plain sight. It’s one of those things that, once you’ve seen, you can never unsee. 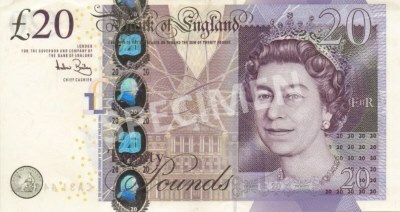 Warning: Once you’ve read this article, you will never look at a bank note the same way again! The term “Eurion” is a Portmanteau of the prefix “Euro” and the word “Orion”. 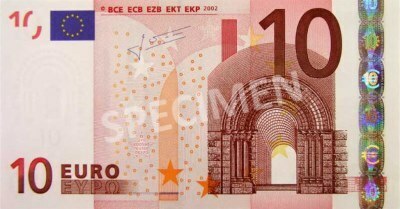 Euro, because some of the first applications the constellation were on the Euro bank notes, and Orion, because the design, as we will see, looks slightly similar to the celestial constellation Orion. Information of the true nature of the design, and its history, are hard to come by. In a ‘security in layers’ approach, the details of this design are hard to come by. A little investigation reveals that the design of this system can be traced back to a Japanese company called Omron, and in 1995, this company was granted a US patent US 5845008 A, entitled Image processing device and method for identifying an input image, and copier scanner and printer including same. 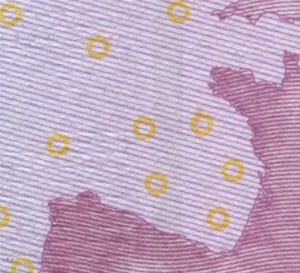 A Eurion constellation is a collection of five rings, printed in a contrasting ink, in the design of the bank note. The diameter of the rings, and their relative positions are, clearly, critically important to the design and function, however, as the specification is a secret I’m not aware of the formal dimensions (even if I were, I’d probably not document them here). If you are interested, pick up a bank note from your pocket and look at the patterns yourself. These patterns are often repeated many times over the bills and at different rotations. Here is an example, and I've highlighted a couple of the constellations. Clearly there is some high-level collaboration going on between governments (who officially print money), and each of the different hardware/software manufacturers of these peripherals. (Research articles on the web suggests that the currency-detection algorithms implemented by software packages are sophisticated and multi-level. 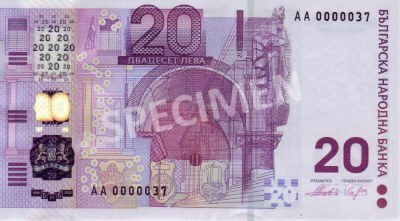 Obfuscation of the Eurion, distortion, or even removal in some cases, still allows the package to detect that the image is that of currency. This implies other detection techniques are also employed). Below are a collection of notes which feature these Omron patterns. This is not intended to be an exhaustive list of all the notes, but just to show how widely this Omron technology is used. Be honest, have you seen them before? Can you find the constellations in each of the designs below? Take some notes out of your pocket, and see if you can find some other constellations right now! Sometimes the constellation is hiding in plain sight. Sometimes they are just part of the background texture. 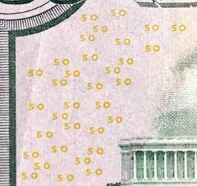 In the image on the left, the Omron circles are 'disguised' as the zeros from the constellation of 50s on the $50 bill. If you look closely, you can see the font of the two digits are different. The 'zero' is a circle (This is even more noticeable on other denominations). On the right, you can see they have been cleverly incorporated as musical notes on a stave. I’ve heard, anecdotally, that these designs might also now be encapsulated into some designs of other official government documents, such as birth certificates. I've not come across any, but it would probably be a worrying trend if people did start to embed these into their everyday documents so that they could not be scanned or copied. If lots of people started doing it, then copiers and scanner would become less useful and, inevitably, patches are work-arounds would be created to bypass these security measures (After all inconvenience does not scale). Once work-arounds become popular, the protection becomes irrelevant.